115 episodes of Monkey Tail Podcast since the first episode, which aired on July 31st, 2012. Join Bruno and Marius on another edition of the Monkey Tail podcast. On this episode, we talk about the games we've been playing the past couple of weeks, and they are; Sekiro: Shadows Die Twice, Devil May Cry 5, Metro Exodus, Dead or Alive 6, Resident Evil 2 and Kula World. We also talk about the year in gaming that was the year 2005. Join Bruno and Marius on another edition of the Monkey Tail podcast. On this episode, we talk about the games we've been playing the past couple of weeks, and they are; Devil May Cry 5, Metro Exodus, God of War, Call of Duty: Modern Warfare Remastered and Axiom Verge. Join Benn, Bruno and Marius on another edition of the Monkey Tail Podcast. On this episode we talk about the games we've playing the past couple of weeks, and they are; Florence, Tetris Effect, Typoman: Revised, Divekick and much more. We also talk about the year in gaming that was the year 1996. Join Bruno and Marius on another edition of the Monkey Tail Podcast. On this episode we talk about the games we've playing the past couple of weeks, and they are; ACHTUNG! CTHULHU TACTICS, Hitman, Iconoclasts and Singularity 5. We also talk about the year in gaming that was the year 2008. 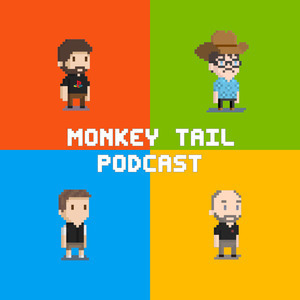 Join Adam, Benn, Bruno and Marius on another edition of the Monkey Tail Podcast. On this episode we talk about the games we've playing the past couple of weeks, and they are Super Smash Bros., State of Decay 2, Tetris Effect, Stories Untold and much more. We also talk about the year in gaming that was the year 1979. Join Adam, Benn, Bruno and Marius on another edition of the Monkey Tail Podcast. On this episode we talk about the games we've playing the past couple of weeks, and they are Red Dead Redemption 2, State of Decay 2, God of War, Alto's Odyssey and much more. We also talk about the year in gaming that was the year 1988. 106: That's it, the last person just stopped listening! Join Bruno and Marius on another edition of the Monkey Tail Podcast. On this episode we talk about the games we've playing the past couple of weeks, and they are Red Dead Redemption 2, Spyro Reignited Trilogy, SteamWorld Dig, Destruction Derby and much more. We also talk about the year in gaming that was the year 2002. Join Bruno and Marius on another edition of the Monkey Tail Podcast. On this episode we talk about the games we've playing the past couple of weeks, and they are Spider-Man, Forza Horizon 4, Detroit: Become Human and Wreckfest. We also talk about the year in gaming that was 1995.